I’ve got a bunch of summer road trips planned, and I’m nervous I’ll end up chowing down on potato chips and mini donuts the whole way. Is there anything healthy I can buy at a convenience store? Protein bars are perfectly portable, but they’re not all created equal. Some contain as many calories as a full meal! So unless you’re planning to forgo your next meal, I suggest looking for bars that clock in at around 200 calories or less. 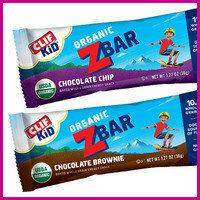 And here’s a GREAT tip: Reach for bars meant for kiddos, like CLIF Kid Organic Zbars! I also like Quest, Kashi, Fiber One, Special K, and Luna. I’m impressed with the way some convenience stores have stepped up their healthy-snack game in recent years... It’s pretty common to see FRESH ready-to-eat produce these days! Grab an apple or a banana, and look for baby carrots and hummus. 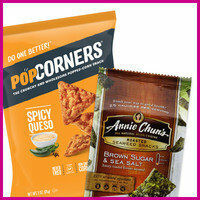 Check out all the fresh snacks 7-Eleven offers! When it comes to better-for-you crunchy snacks, I’ve found that baked or popped chips are the easiest to find at convenience stores. I love seaweed snacks and crispy bean snacks, but those aren’t as common. (Stock up at the supermarket, and toss a few in your bag!) My best advice here, though, is to avoid grabbing one of those giant multi-serving bags. It may be a bit cheaper than getting several single-serve bags, but it’s way too easy to keep munching until the whole thing is gone! More and more often, I see hard-boiled eggs sold by the pair at these places. So great! 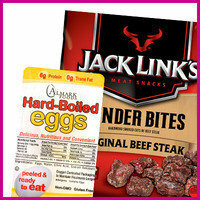 Those are packed with protein to keep you full and satisfied. (Feel free to ditch a yolk or two, if you want, to save some calories and fat grams.) Other protein picks: light string cheese, jerky (check the labels though; some are pretty fatty), and fat-free Greek yogurt... Don’t forget to grab a spoon! One more thing... Hydrate! It may mean more bathroom stops, but I highly suggest drinking plenty of water on your trip. It can stave off hunger in a big way! If plain water bores you, try sparkling water. I love the lightly flavored unsweetened kinds! 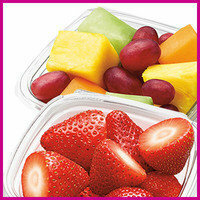 The BEST way to keep up your healthy-eating habits on long car rides is to pack your own snacks! 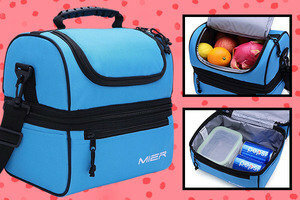 This best-selling lunch tote from MIER is so fantastic, I honestly can’t believe it’s under $20. It comes in three colors, and it has two different sections so you can keep chilled stuff separate. There’s enough room in the bottom square section for lunch, perishable snacks, and a cold pack. The top is perfect for shelf-stable snacks. And the front pocket makes it easy to keep plasticware and napkins within reach. Nicely done, MIER people! It’s June 6th, National Applesauce Cake Day. Enjoy all the moisture sans apple flavor in this Fudgy Flourless Chocolate Cake. Yum! Snacks for all! Click “Send to a friend” to share these tips.